You've probably seen people doing external rotation exercises as part of their warm up before sports, activities or heavy exercises that involve the shoulder. They are often used as a treatment to shoulder impingement and generally prescribed by a Physiotherapist or other health professional. Being scared to re-injure the shoulder, most people utilize them in their warm up even after the injury has resolved. Shoulder impingement is an extremely common condition of the shoulder and one that I often see in a clinical setting (anecdotally very frequently in 'gym rats'). Rather than dive deep into why this is a common issue with the shoulder, I would like to discuss how to do these exercises correctly and briefly touch on why they are important. These exercises target the rotator cuff muscles which help to provide stability, range of motion and strength to the shoulder joint. More specifically infraspinatus is targeted during the motion of external rotation. This is important because when infraspinatus is strong it helps to stabilise the humerus which prevents 'jamming' of the subacromial space. 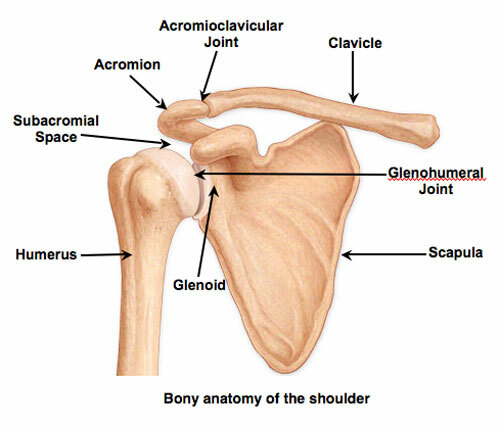 The subacromial space is important because that is where the tendons and bursa of the shoulder joint are located. If this space becomes compromised or decreased there is an increased chance that structures that run through here may become impinged, torn or inflamed. You can see the subacromial space in the picture below. The video below demonstrates the most commonly seen external rotation exercise for the shoulder. It is completed in the gym with a cable machine although can alternatively be completed with a free weight or resistance band. The video quickly demonstrates how to do this both incorrectly and correctly. Common mistakes when completing external rotation include poor stability and poor posture. Poor stability: When you try to complete external rotation too quickly or with a weight that is too heavy you lose stability through the movement. This often results in a movement that is too large or jerky. The muscles of the rotator cuff are smaller and weaker than the big thick deltoid muscle that sits over it. When you complete this motion in a difficult to perform environment the strong deltoid muscle tends to take over, taking the focus off of the rotator cuff. Poor posture: If you complete this exercise with your shoulders rounded forwards the subacromial space is already compromised before you even start the exercise. This is counter productive to what we are trying to achieve. It often happens when people are looking down at what they are doing, where possible try complete this in front of a mirror to avoid that from happening. I know this was brief but, hopefully you've learnt something useful in what I have written. As per usual I am more than happy to see new and existing clients to run them through this if required. World Gym North Lakes (where I am currently located) is a perfect set up as it has a great range of equipment to complete this in different variants. However, hopefully now after reading this you understand how to complete this exercise correctly and the benefits it has on the shoulder joint. Feel free to put it to good use!